Sherburn Court in Leeds – 7000 Helifix remedial wall ties installed tested and guaranteed. Works to enable follow-on application of External wall insulation. The ‘Brick-Tie’ in our company name says it all: we’ve been specialising in wall ties for 30 years and are confident that we’re the most experienced commercial wall tie specialists in the north of England. Commercial wall tie surveys and brick tie work differs from domestic situations for a variety of reasons. Many commercial buildings are multi-story, quite literally adding more layers of complexity. They require specific knowledge of commercial building design and construction – a requirement we easily fulfil. For domestic and residential wall tie surveys please transfer to this section. Our surveyors are able to offer comprehensive corrosion surveys, as well as mapping wall tie density, orientation and tie embedment too. Surveys can be carried out from cherry pickers, scaffold or even internally in some situations. We know the relevant standards and statutory obligations in-depth. We will be able to provide clear and sound advice in just about any situation. This has given us plenty of first hand experience in dealing with all kinds of commercial projects. For example, we introduced ‘special precautions’ to reduce contamination of cavity wall insulation during wall tie work. We did this a full five years before the advice to do this was incorporated into the BRE digests. Our own research had already identified the risk of dampness, which remedial wall tie installation could cause. We proof tested remedial measures and implemented them as part of our own quality control standards. When BRE incorporated identical independently researched advice into official guidance, this validated our approach (and suggests convergent evolution applies to wall tie work)! It’s one reason why we are Yorkshire expert commercial wall tie specialists. Experience is key. We’ve seen lots of past remedial wall tie projects, where a combination of blind application of the ‘specified tie’ or, a failure to train installers has wasted huge sums. We know this because we regularly carry out wall tie installations, where previous remedial works have been done incorrectly. Sometimes the defects are shocking; loose ties, untreated rusting ties and contaminated cavities. Our quality control is exemplary and is designed to find and avoid these defects from the start. All our installation teams carry a regularly calibrated tension rig. Each rig has a range of pull-out adaptors for all of the ties we install. Detailed written records and digital images of gauge readings are taken for every project. Our technicians test, test and test again – whether or not the clients asks for this. It’s one reason why we are the ‘go to’ commercial wall tie specialists in Yorkshire. Types of wall tie system; used and approved. We’re Helifix approved installers. The entire range of Helifix wall ties and lateral restraints are used by us every month. This means we are well practiced and know which wall tie works best in what type of building. Only experience brings this level of expertise. Resities, Bowties, CemTies, SockFix and RetroTies are installed. We know when each is the right wall tie for the job and, when it’s not. We are Cintec approved too, having being installing these remarkable expanding sock anchors for well over 20 years. Commercial wall tie survey and wall tie installation by IPAF qualified staff – safe and competent. If the project is simply a survey prior to transfer of a lease, or refurbishment and modification, our written reports do the job. Often reports include supporting digital images, helping our clients get things in context at an early stage. We can produce a credible and robust wall tie solution, whilst also value engineering the specification to meet cost restrictions. Pre-commencement testing and evaluation is available too, for a guaranteed smooth and efficient project. CDM 2015 and client duties on employing a contractor. “Having suitable or sufficient skill, knowledge, experience, etc., for the task; properly qualified”. That’s Brick-Tie! We are committed to the promotion of a positive health and safety culture throughout our firm. All projects are risk assessed and a thorough safe system of work agreed before commencement. Ongoing safety and health monitoring is carried out too and we strive to meet or exceed our commercial clients own health and safety rules wherever we can. As commercial wall tie specialists we work in a hazardous environment. Working at height on busy sites in all weathers. We use powerful electric tools, some chemical applications and of course, highly alkaline cement and lime. Silica dust is a worrisome hazard in construction, but we work hard to avoid and suppress dust as much as possible. Our managing director leads health and safety from the top, having both Nebosh general and construction certification. We are CHAS registered, Construction Line registered too. Everyone in the firm is involved in promoting our culture. Despite being a small firm we have our own in-house qualified face2fit mask face fit tester, manual handling trainer and a technicians health and safety representative (IOSH managing safely qualified). All our training and staff development works towards a happy and efficient business. That’s why we are Investors In People. Our compliance is also audited by our independent consultants Stallard Kane. Having won a silver award for our compliance in 2015, we are delighted to announce that in January 2016 we were elevated to ‘Gold’ standard for health and safety compliance. This is a level of compliance normally attained by much bigger companies, who have more financial resources available for health and safety. It is testament to the extra effort we put in to keep our customers, contractors, visitors and each other, safe and well. 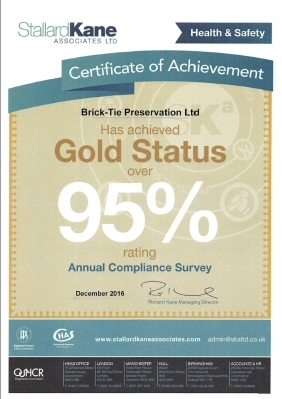 Since then we have once more attained Gold standard in our December 2016 audit. We do of course have many accreditations on our accreditation page. However below are just some of the health and safety related certifications, which individual technicians hold. These are crucial for safe commercial wall tie specialists to have. In addition, for those who require more details, please visit our blog for specific commercial remedial wall tie information and case studies – some of which are linked lower down the page…. For domestic and residential wall tie installations please visit our wall tie services section. The Grand Hotel, Scarborough. Built in 1863-67. Architect Cuthbert Brodrick. The patio overlooking the sea was repaired and modernised in the early 21st century. Many Helifix stainless steel remedial wall ties were installed and tested by Brick-Tie’s wall tie technicians.